There are many people asking us for help about FUT 16 Web App. But there are many more who still have problems. As always, we are here to try to help you and we have compiled some suggestions to the FUT 16 Web App Most Common Problems. I am registered in Origin but I can’t get into the FUT 16 Web App. The FUT 16 Web App early access is only for who have created a security question/answer before August 1st 2015. If you are a new player, you will need to play in the console first before you can access to the Apps. I don’t know how to enter in FUT 16 Web App. 1) Type “https://www.easports.com/fifa/ultimate-team/web-app” in the address bar of your internet browser. 2) Choose the main console where you will play. 3) Enter the answer to the security question. 4) Confirm the club name and its abbreviation. 5) You are ready to go ! I can’t get into the FUT 16 Web App. It’s says to try later. Clean the cache of your browser and try other browsers (best results are being reported to us with Firefox). If it doesn’t work, that’s because the servers are overloaded and you will have to wait. I can access to the FUT 16 Web App but the market is unavailable. If you haven’t played FUT 15 in the console where you plan to play FUT 16, the Apps will not make available the market’s earlier access. 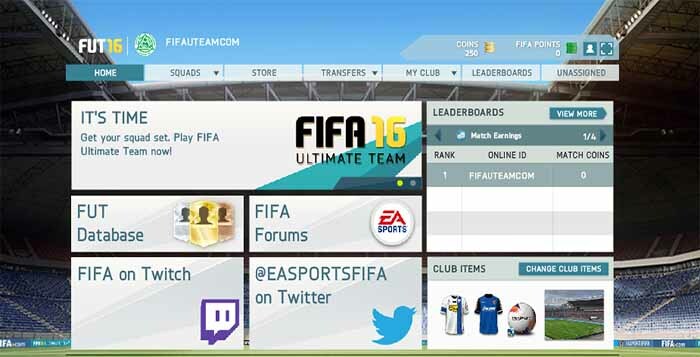 You need to validate your FIFA 16 account in the new console to unlock the market. I can’t see the full screen of FUT 16 Web App. Use CTRL- to zoom out until you see the whole window. I can’t get into the FUT 16 Web App on my mobile. The App to mobile devices is the Companion App and it will be available only after you access the FUT 16 Web App. FIFA Points are only available before the game release in the early access of EA Access subscribers. Where is my daily gift ? Daily Gifts are available in the FUT 16 Web App starting on September 15th. It is limited to one per day. In the days you don’t open the Web App, you will loose the daily gift of that day. Pick yours up each day at 12am UK. I no longer can access the FUT 16 Web App. If you had access to the FUT 16 Web App but no longer have, even if you haven’t made any change, you should know that EA Sports is blocking App access to all players that haven’t played FIFA 16 in the console until midnight of October 1st (UK time). To keep using this App, you will need to buy the game. Exactly. Web App for FIFA 16 is not available anymore. I’m not able to access the FIFA 17 Ultimate Team Web App of the mobile FUT app, anyone else had this problem and found a solution? I’ve gone onto the EA forums and none of the advice they give has helped. It says…”Early mobile start has ended….” and then on the desktop web app it says I need to purchase a copy of the game (I have and I’ve been playing for weeks!!) but I can’t get into the trading app. I really enjoy Ultimate Team but if I can’t trade on the app I’m becoming disillusioned with it, can anyone help? Can you please double check if you are using the same account? If nothing works, please contact the EA Support here. Mine says i dont have a club when I do. Can you use that club in the console? If he is doing everything right, please contact the EA Support. “Sorry, Fut Web Access is no longer available”” What does this mean, I was able to use it yesterday. It is working with us. Probably it was a temporarily issue. I forgot what my FUT security question was on Fifa 15 and I got locked out. How do I change my Fifa 15 FUT security question. You just need to logon in your console and you will be ready to go. The web app signed onto my 2nd account and I want it to work on my main, is there anyway I can switch the web app accounts? Did you tried the ‘sign out’ button in the top right corner? What about the ‘change your active persona’ button in the top right corner? Please contact the EA Support. I Dont remember the answer for the security question what should i Do? Please, try to lg in in your trusted console. You will have the chance to create a new one. Every time I try to create a squad on fifa 16 it says that “this action could not be completed because the item specified could not be found” Then deletes all my progress on the squad. and then disconnects me from ultimate team after i leave the squads screen. When I try to sell players, it gives me this: “Cannot move item” with a whole story, or I get: “This item cannot be sold because you don’t own it”, while they’re in my club! I’ve already logged out and in again, refreshed the browser and I’ve cleared my cache memory. Can you help me? It shows 3 slides that I can slide about then it just says learn more in the bottom right, how do you actually get on the app ! When I log into my account for EA Sports online, I sign in, then it asks for a security code. Where can I find the security code. I checked my phone, my email, and there is no code to be found. Go to your Origin account or contact the EA Support please. I cant connect to FIFA 16 ultimate team on my xbox360. App won’t let me sell players I go to list them on the market and it keeps saying they don’t exists ? Any help ? PSN ID / GT ?! I still can’t get on the webb app or my FUT, but my brother can acces his account. How do I solve this problem? Contact the EA Support, please.